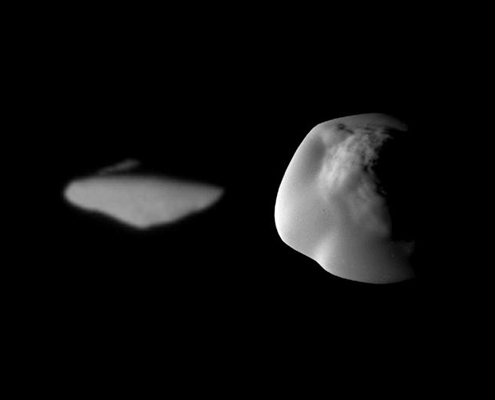 The unusual flying saucer shape of the Saturnian moon Atlas is seen in this photo from NASA. Saturn is the biggest show in the May evening sky. It’s already up when it gets dark, a bit over a month past opposition, and its rings are still very close to edge on – less than two degrees as viewed from Earth. And it has a few moons, of course. Aside from bright Titan (magnitude 8.4), Saturn’s moons are elusive targets compared to Jupiter’s four Galilean moons. But Saturn’s moons make up for lack of brightness with sheer numbers. It has so many that it’s hard even to list how many moons Saturn has, since more are being discovered all the time. http://saturn.jpl.nasa.gov/science/moons/ lists 54 named satellites (by the time you read this that number may have changed again), and of course there are hundreds of smaller ones – even if you don’t count the millions of particles that make up the spectacular ring system. For an observer with a small telescope, your main targets will be Rhea, Tethys, and Dione, all around 10th magnitude. Owners of larger scopes can add 12th magnitude Enceladus. And both groups can target the odd moon Iapetus: like one of those sugar cookies half dipped in chocolate, Iapetus’ leading edge is very dark while the trailing edge is bright, so its brightness varies between 10th and 12th magnitude depending on which side is pointing toward us. Saturn has other fascinating but less observable moons. Perhaps the weirdest are the miniature “flying saucers” Pan and Atlas. Both are tiny – only about 10 and 20 km respectively – which unfortunately makes them far too faint to see with a small Earth-based telescope. They probably each play a part in maintaining order in Saturn’s ringsystem: Pan is actually inside the Enke division in Saturn’s A ring, while Atlas skirts the outer edge of the A ring. And don’t discount Titan. Though it’s no longer the largest moon in the solar system (Jupiter’s Ganymede turned out to be larger), Titan is plenty interesting. It has methane lakes, and may have a “methane cycle” much like Earth’s hydrologic cycle, with liquid methane and ethane raining down into lakes and rivers, which then evaporate into clouds before raining down again. A report in the last month predicted a huge underground ocean of methane, based on analysis of Titan’s gravitational influence on the Cassini spacecraft. So there’s plenty to look at – and think about – while you’re looking at Saturn. Venus is also prominent in May’s early evening skies. If you’re star partying on the evening of Saturday the 15th, a slim crescent moon, just two days past new, sits a few degrees below gibbous Venus in the evening twilight sky. It should be a lovely view, and a beautiful start to any star party. Parts of Asia and Africa will see an occultation, but from here Venus and the moon never get closer than a few degrees (they will have set before they make their closest pass). Venus also passes near the open cluster M35 around May 21st, a Friday, so grab a binocular or wide-field telescope and take a look. Mars is still visible in the evening sky, but it has shrunk to half its opposition diameter. It’s getting tough to see any detail on such a small disk! But if you’ve been watching it throughout its opposition, you’ll probably still be able to make out some of the major features. The rest of the planets – Jupiter, Uranus, Neptune, and Pluto – are in the morning sky. Mercury, which spends most of May hiding out behind the sun, joins the other morning planets at the end of the month.